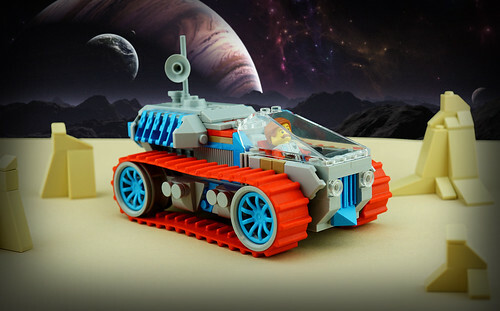 TFDesigns has been rolling out some very interesting rover designs this month, including the one you see just below. This rover, for whatever reason, seems very playful to me (and certainly friendly). I think it's the choice of the bright colors that seem to call: "Come closer! I won't roll over you." This model also shows us that you don't need any truly specialty parts to make a solid rover, you just need a bit of creativity! Well done indeed!